Overall, a fair number of mainstream consumers still don’t fully understand what connected-home devices are and how they work. However, adoption and awareness is still high for such a new category. We expect the devices to become more prevalent in the next two years, when growth will peak. 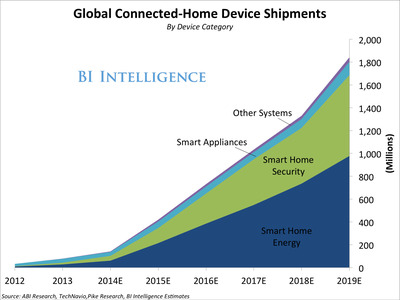 Connected-home device shipments will grow at a compound annual rate of 67% over the next five years, much faster than smartphone or tablet device growth, and hit 1.8 billion units shipped in 2019, according to BI Intelligence estimates. Connected-home devices include all smart appliances (washers, dryers, refrigerators, etc. ), safety and security systems (internet-connected sensors, monitors, cameras, and alarm systems), and energy equipment like smart thermostats and smart lighting. 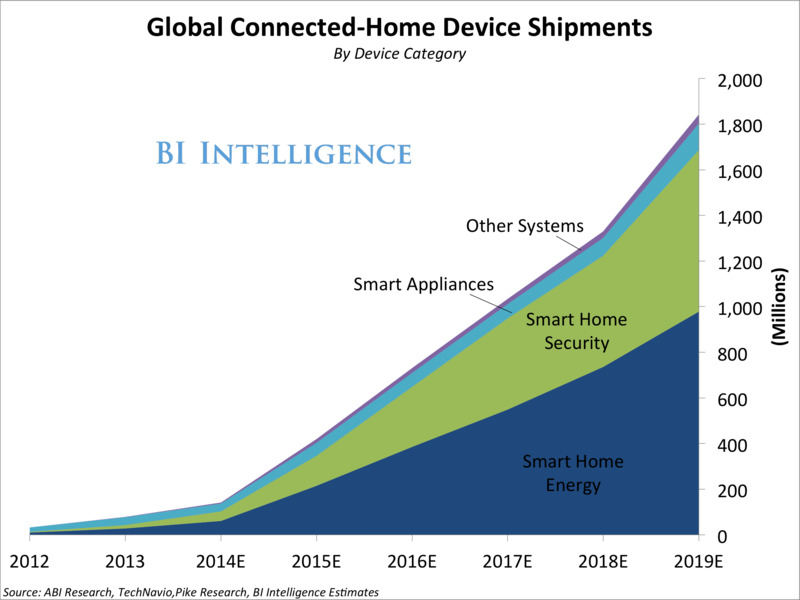 Connected-home device sales will drive over $US61 billion in revenue this year. That number will climb at a 52% compound annual growth rate to reach $US490 billion in 2019. Estimates the connected-home market’s annual revenue potential between 2014 and 2019. For full access to all BI Intelligence’s charts, data, and analysis on the mobile and Internet of Things industry, sign up for a trial.